Its ok to be a little nervous thinking about something you have never done! Our goal is to facilitate an experience that will be fun, not stressful. We will never ask you to do anything outside your ability or comfort level. Our guides are courteous, approachable, and polite, and here to help you get confident! They are great teachers that can pick out small flaws in your riding, if any, and give you quick techniques that will have you driving like a pro in minutes! 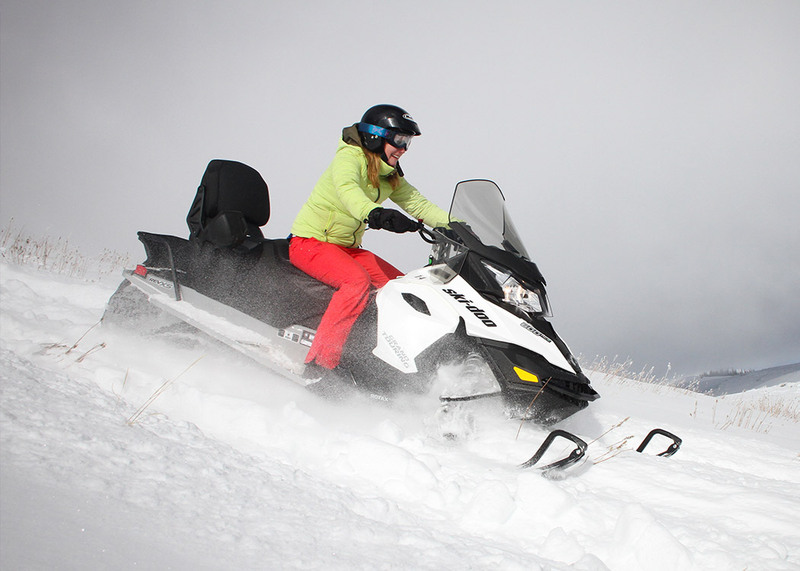 Our snowmobiles are manufactured by BRP, the mother company of Ski Doo, a monstrosity of a manufacturer that makes wave runners, snowcats, airplanes, snowmobiles, etc. In short, they drop millions and millions of dollars into their engineering and development of snowmobiles so that they are the most fun, and easiest snowmobiles to drive on the planet. BRP is great at what they do. Our equipment is second to none. We have all our snowmobiles on a 2 year rotation, meaning nothing in our fleet has been used for more than 2 seasons. What does this mean for you? Cutting edge equipment that gives you confidence and allows you to enjoy what you’re really out to enjoy. No need to stress on old, lame equipment that feels like it’s going to fall apart! As for the trails, our grooming team and schedule are setting new standards in the state. We boast 3 snowcat groomers, like the ones you see on the ski hill, and 5 finish grade drag groomers that are pulled behind a snowmobile, and a team that takes great pride in the “art form” of creating the best riding surface possible. NEVER will you encounter the dreaded snowmobile trail “whoops” or “washboards”. That is out of the question for us. Only on those super windy days will you find some off camber sections of trail from snow blowing around, but rest assured, you will probably see a team of guys in green jackets buzzing around the mountain trying to keep up with mother nature as best we can! We maintain a riding area bigger than Vail ski area, exclusive to Sage guests only. Though marijuana has been legalized in Colorado, Sage continues to hold strong to our “Drug Free Workplace” policy, to ensure our customers are teamed up with crisp, clear eyed guides that are high on life, not on a substance. Guides, drivers, and phone reservationists are all entered in a random drug and alcohol screening pool. Its ok to be a little nervous thinking about something you have never done! Our goal is to facilitate an experience that will be fun, not stressful.